This learning program acquaints learners with fundamentals of art, teaches how to analyse masterpieces, and shows how the conception of painting influences the composition of painting and how to understand hidden meanings of a painting and the artist's idea. The students are taken into the voyage to the amazing world of art. 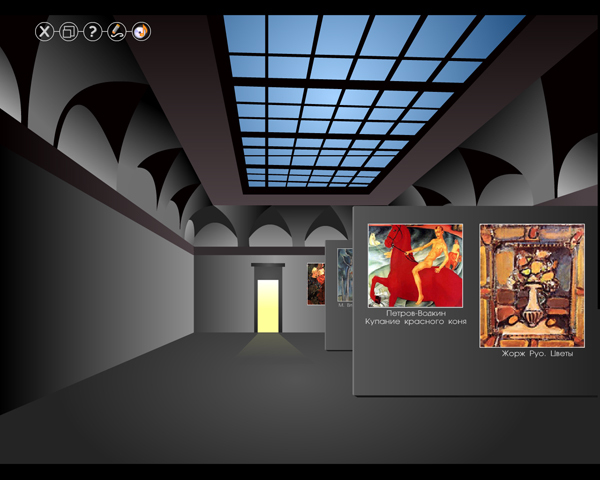 They explore the virtual museum accompanied by 3 virtual guides, which offer their different views on art. A non-traditional mode of educational material presentation, in the form of a dialog between the heroes, enables the teacher and students to form absolutely new, heuristic approaches to the perception of art. Muse - the enthusiastic and ironical lady (the canvas "The allegory of painting" of J. Vermeer from Delft). Timaeus - the connoisseur of art (the canvas "Portrait of a man with a medal" of Sandro Botticelli). Artist - the intelligent and sensible master of art (the canvas "Self portrait" of Nicolas Poussin). Each lesson is divided into pages and consists of two main parts: lecture material and practical exercises. 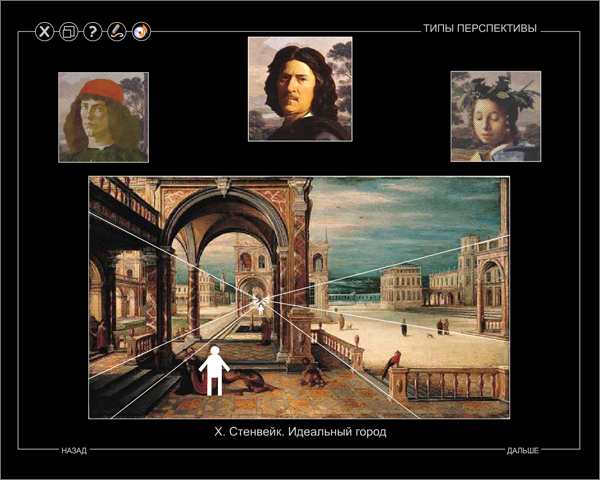 Inter-related topics allow exploring linked multimedia resources to know more details about history of pictures, art movements or artists life. Library includes glossary, artists' biographies, the book of Ecclesiastes (abridged), etc. 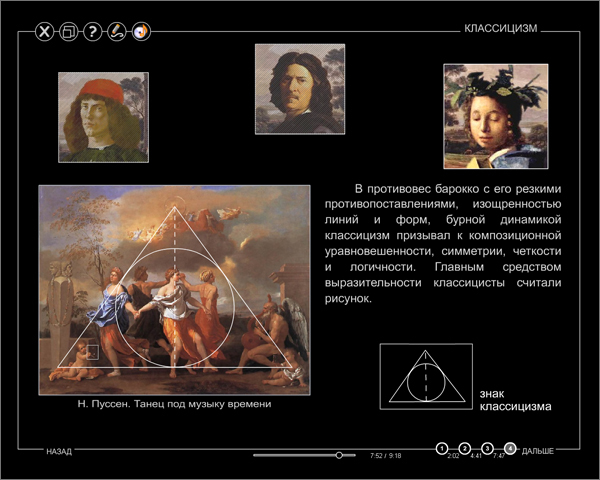 Optional lesson is dedicated to A. Rublev's "Trinity". Storerooms contain all the reproductions used in the program in an alphabetical order. Examination room allows learners to test their knowledge. Relaxation room lets visitors contemplate masterpieces of art. The program can be effectively used at regular and optional classes in such subject areas as Art, Literature, History, etc. It designed for whole-class teaching projected on the screen or whiteboard and individual computer-based learning. The program allows teachers to carry on a dialogue with learners or conduct discussions, apply different teaching methods and check students' progress. 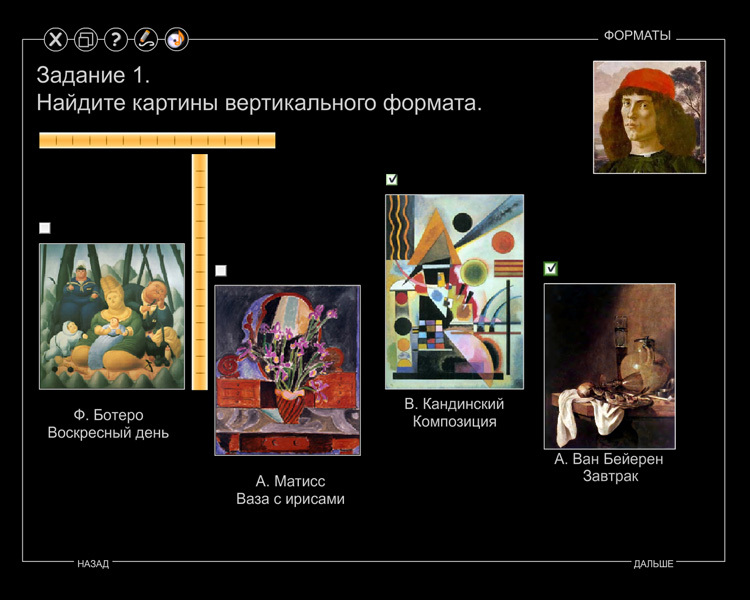 This software is suitable for schools and specialized establishments or individual art lovers. The recommended age is 12+. The author is L. Smirnova, a Candidate of Arts with a length of teaching experience over 20 years.